- For people who self custodial their cryptocurrencies — people can have multiple wallets for different cryptocurrencies. 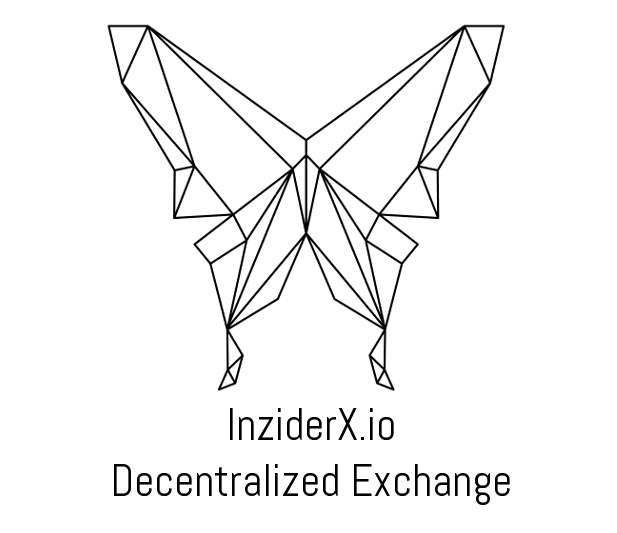 - For people who store their cryptocurrencies on exchanges — 1 wallet address does not equate to 1 user on the exchange. It’s also typical for exchanges to create a wallet address for each transaction. 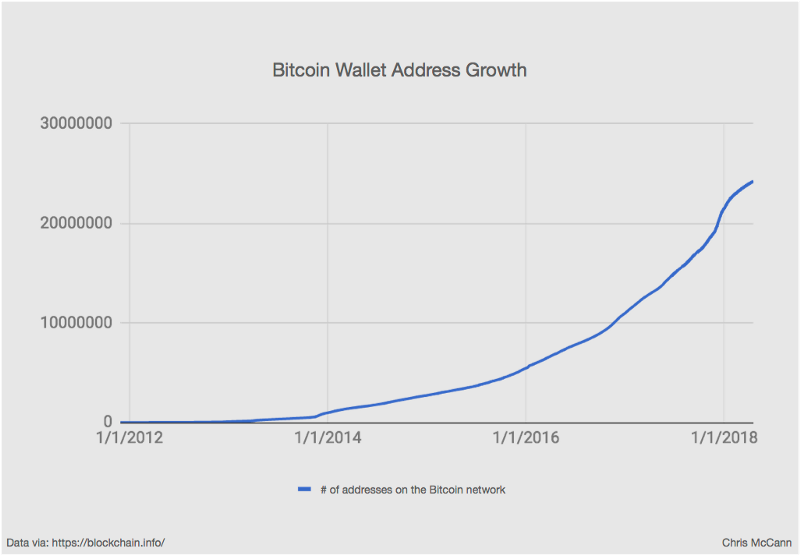 There are ~24M bitcoin wallet addresses in total. This doesn’t mean there are 24M Bitcoin users because one person can have more than 1 wallet address and it is recommended to generate a new bitcoin address for each transaction sent. I would consider 24M the upper bound number on the number of bitcoin users worldwide. 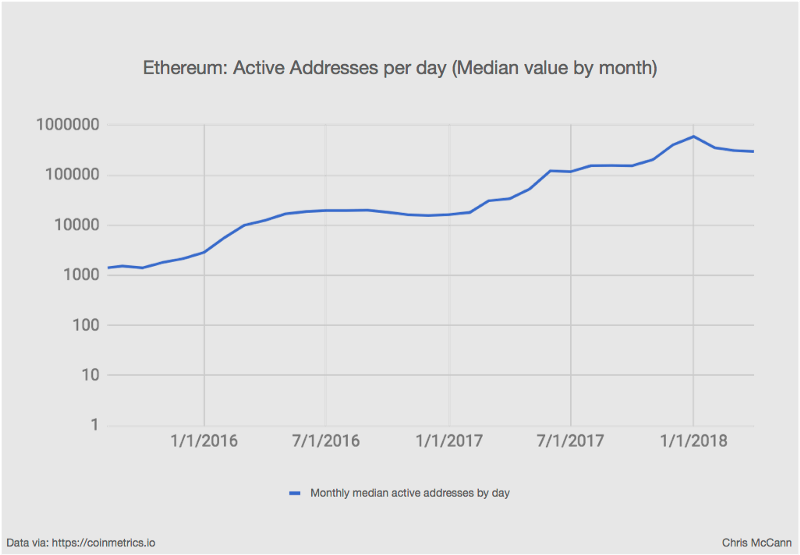 In addition to looking at the number of wallets, we can look at the number of active addresses per day. 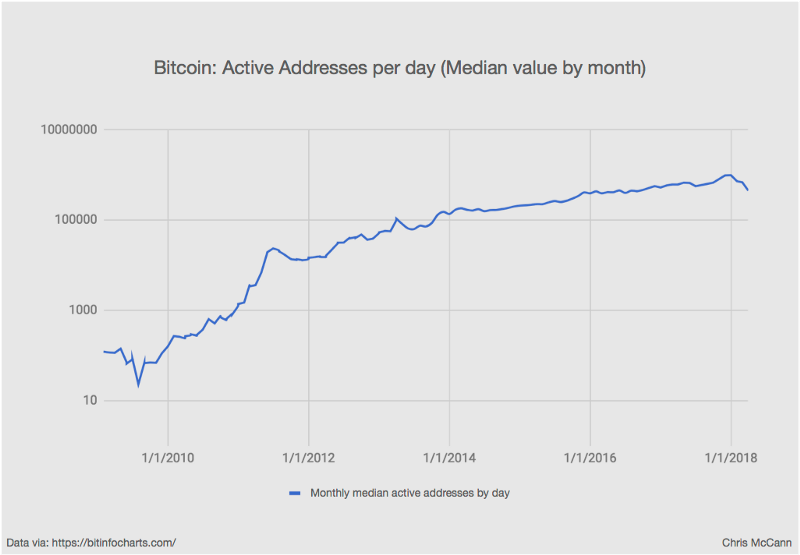 The highest amount of active addresses we’ve seen per day was ~1.1M addresses — this is an approximation of daily active users (DAU) within the bitcoin network. However, if the main point of Bitcoin is viewed as purely a store of value, then you would assume a much lower DAU vs. any traditional mobile application or website. 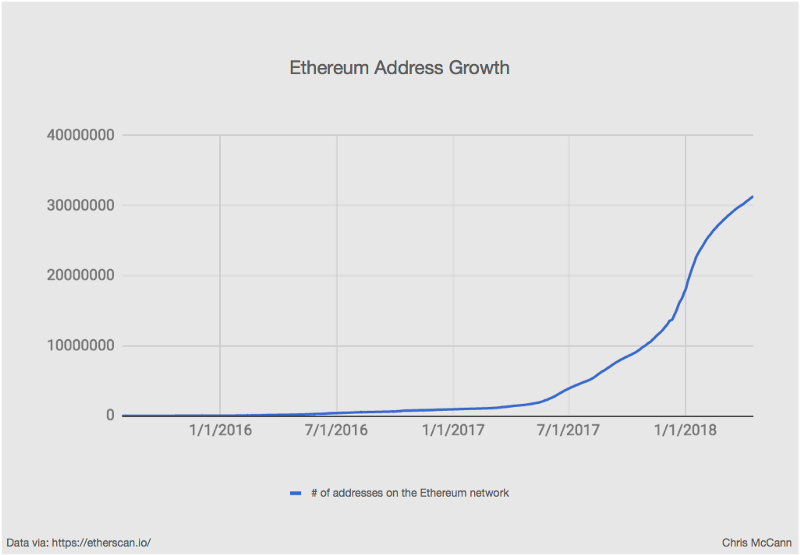 In total, there are 31M Ethereum addresses with peak daily active addresses on the Ethereum network reaching 1.1M. Ethereum is a bit different than bitcoin because smart contracts have their own addresses and usage on Ethereum should naturally be higher since Ethereum is designed as a smart contract platform, not as a pure store of value. Users of bitcoin and users of ethereum are not mutually exclusive as well, I would assume a high degree of correlation between the two cryptocurrencies. 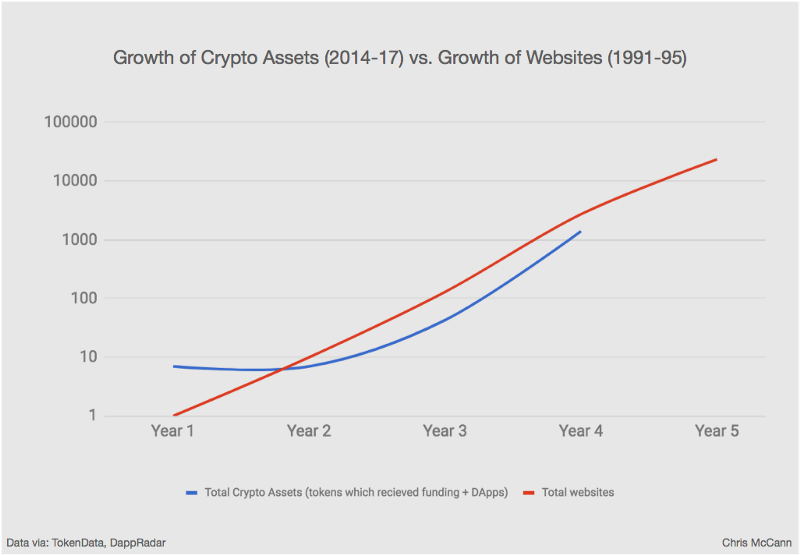 Another method to approximate the user growth of cryptocurrencies is to instead look at the exchanges themselves — both fiat-crypto and crypto-crypto exchanges. 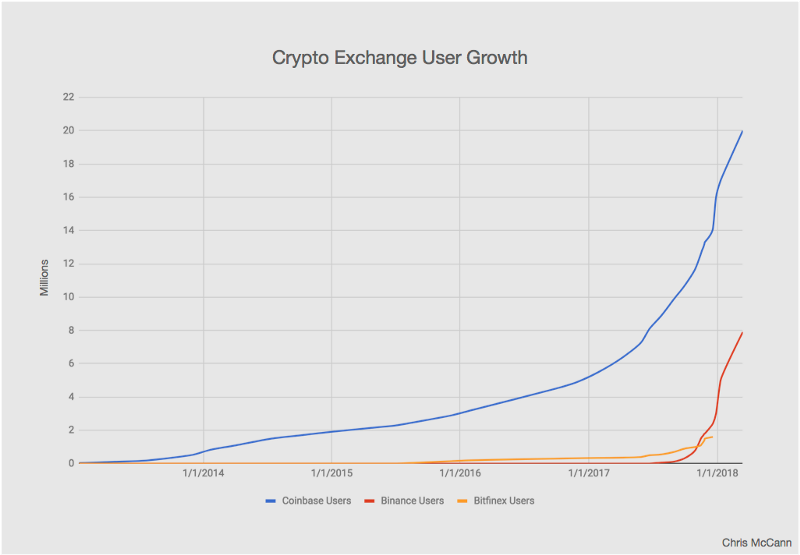 Only a handful of crypto exchanges have published their total user stats & user growth statistics. Furthermore, if we take all of the exchanges where we know the user counts and trading volume, we can come up with an estimated trading volume per user. Through this number, we can forecast across all trading volume what the estimated users of cryptocurrencies as a whole are: 20.2M users. I would consider this the lower bound on the number of cryptocurrency users based on the number of people who are trading & purchasing cryptocurrencies across all of the various exchanges. 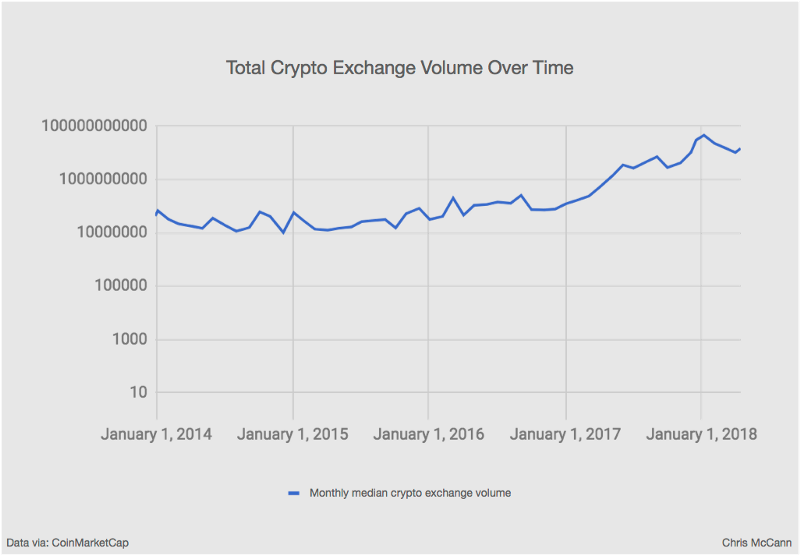 Furthermore, we can also look at the overall trading volume of all cryptocurrencies over time to see how trading volume have been trending from 2014–18. The chart below is also in log scale and the values have been averaged out per month to get a better sense of the overall trend line. While all of these measurements are not exact counts of users, I would approximate the total users of cryptocurrencies to be between 20M-30M people in total worldwide. 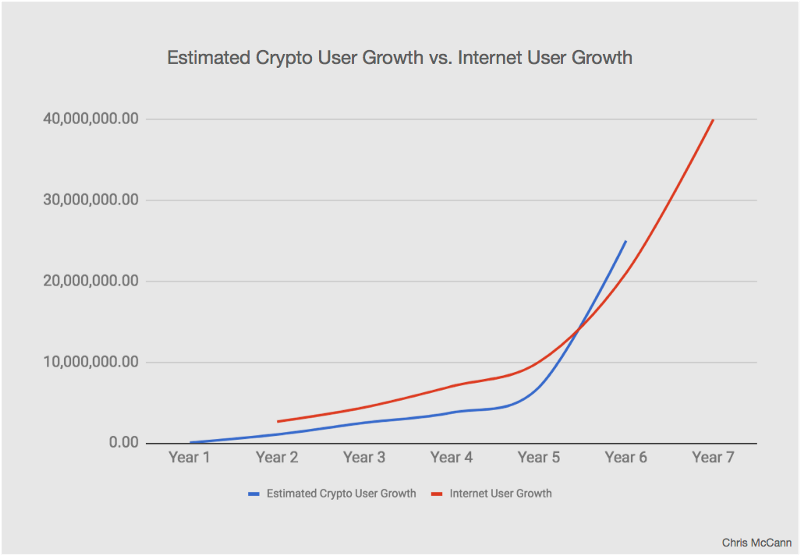 Now that we have an estimate on the total number of cryptocurrency users worldwide, we can look at the growth of the internet and estimate how early we are in this trajectory. 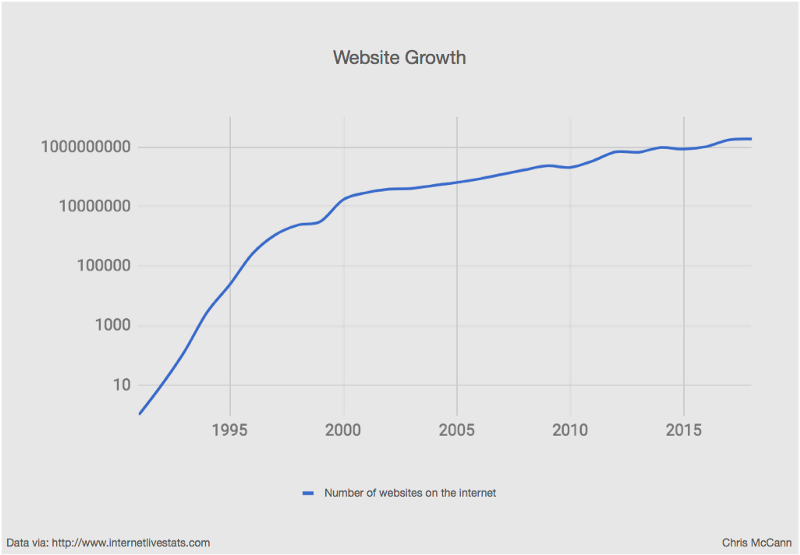 You can see we’re actually tracking quite closely with the early days of the internet. 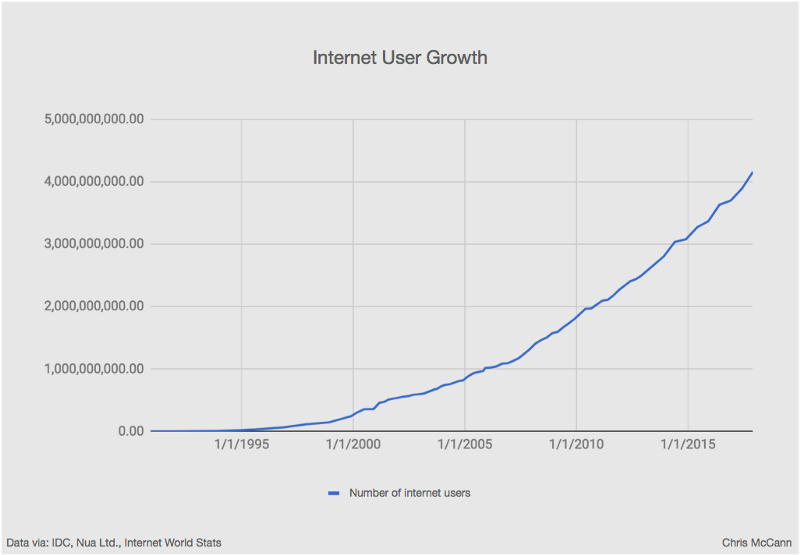 If you think cryptocurrencies is going to follow a similar trajectory as the internet, we look like we’re in about year 1994 compared to the internet. We are at year 1994 on this comparison as well. For one last comparison we can look at the total number of internet companies which received funding from 2014 to 2017 compared to the number of internet startups that got funding from 1991 to 1995. 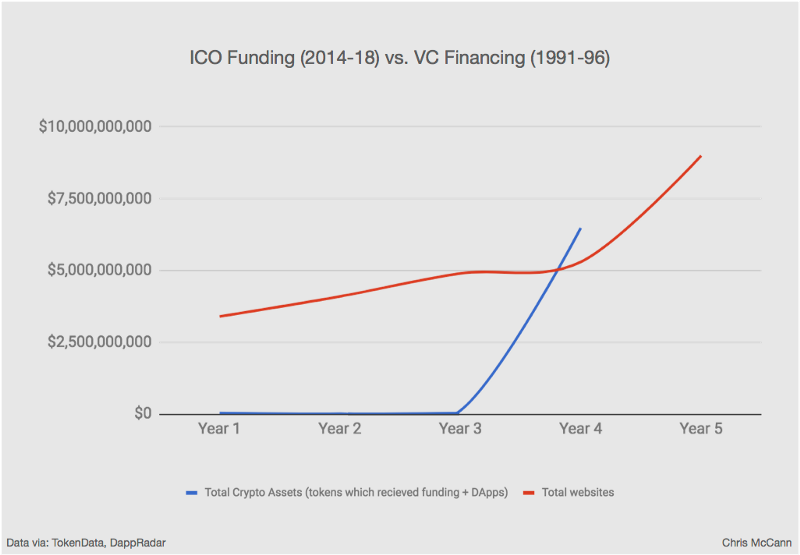 *Funding amounts are adjusted for inflation and only account for internet/software company financings.